Retrofitting the Lummoxie Template with Blogger's threaded comment system has been a few months in coming, but no one is counting, right? [Gulp] I don't want to dwell on this... To make haste as our more punctillious brethren might do, and by that I mean to get to the point, seems a bit more appropriate. And the point is of course, that the Lummoxie template has been updated and retrofitted with Blogger's comment reply functionality. A second notable improvement is the restyled PageList/LinkList widget which now accommodates new line wrapping or longer link links. 2 column liquid/fluid layout, all sections "widgetized" or "gadget-ready"
Supports Blogger Dashboard editing tools, easily change fonts and colors in practically all areas of the template via the "Template Designer," within the "Advanced" subcategory. Title setup optimized and corrected for better SEO. "Calendar Style" post date. Set up instructions in this post. Equipped the horizontal navigation bar with new-line wrapping, allowing for multiple lines of links / more links / longer link lists. Usage instructions in this post. This template is fully functionional immediatly, ensuring optimal performance necessitates one specific setting in the dashboard (for the calendar style post date) which is explained in the premier Lummoxie Template post here, along with additional and advanced editing details. I hope existing users and new users alike are pleased with the updates to the Lummoxie Template. Though I can't personally assist various aspects of implementation & customization of the template, I welcome your feedback on the template. 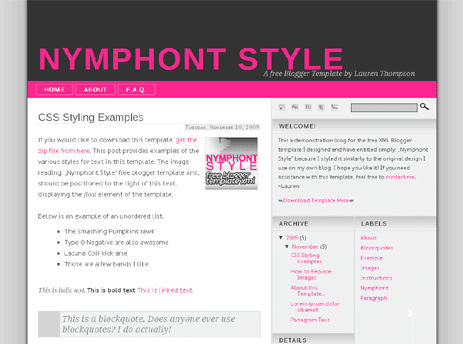 Making yet another stride in my goal to modernize of all of my free Blogger template designs and retrofit them with threaded comments, the new "Nymphont Style," template is up-to-date and ready for your blogging pleasure. I do hope the updates are pleasing to those stylish bloggers' already sporting a version of the template, and to those who might like to as well. Modernization of the code and a little streamlining to the aesthetic make for the more inconspicuous changes in the new template, while major renovations to speak of include the threaded comments, which have been enabled, new-line wrapping capabilities in the horizontal LinkList and PageList widgets, creating the design and giving style to Blogger's Jump-break ("read-more," or post-summary links), and also the ability to add Blogger's share buttons to the post-footer. Yay! A sample comment and threaded-reply from the demonstration blog is shown in the above screen-capture. Since their debut, share buttons have been the most requested template feature I have received by far, and Blogger's threaded comments have recently become the second most requested feature I have received. I am stoked to get both of these tasks accomplished for those that asked, whom, I would like to add, have been beyond patient! The new "Nymphont Style," template, and all of my planned template-updating would be impossible if it were not for your feedback, suggestions, and kindness. Thanks so much Blogger enthusiasts! The pink text given the thin pink border shown in the image above depicts the default style for a Jump-Break (read more/post summary link) in the new template. Also visible in the above image, Blogger's post sharing buttons in the new "Nymphont Style" template's post-footer. To accommodate the newly implemented Blogger share buttons and Jump-Break (Blogger's read more/post-summary link), the post-footer underwent a little restructuring. Akin to all other areas of the template, individual color options for the border and text color are provided for the Jump-Break link in the Template Designer's "Advanced," editor. The horizontal navigation bar utilizes either a LinkList or a PageList widget to function, and accommodates more items (the links) than the previous version. Items that are unable to fit within the first line will handsomely wrap onto and become a corresponding new-line, as the links do in the image example shown above. The new-line wrapping permits the LinkList widget or PageList widget used to accommodate lists containing only a few items or links, to those containing many. in the template code. Just below this in the template, you will also find the code for the search form. Working immediately requiring no effort on the user to implement, the sidebar boasts social network icons for which to share your blog, along with a blog search utility. Font and text style definitions added to the "Advanced," editing options within the Template Designer allow for a much more pleasing visual to text. Another seemingly less-conspicuous yet substantial improvement in new "Nymphont Style," template, has been the addition of Bold and Italic font definitions to the "Advanced," editor of the Template Designer. Seemingly would be the emphatic word in there, as these new definitions allow the user to set a specific font-face and style to italicized text and bold text. This means, any time the user selects texts within a post to appear bold or italic, it will be styled as per their definitions set within Template Designer's "Advanced," editor. Simply styling bold and italicized text the right fashion can have an incredible impact on the blog's typography, substantially improving it's presense and readability. 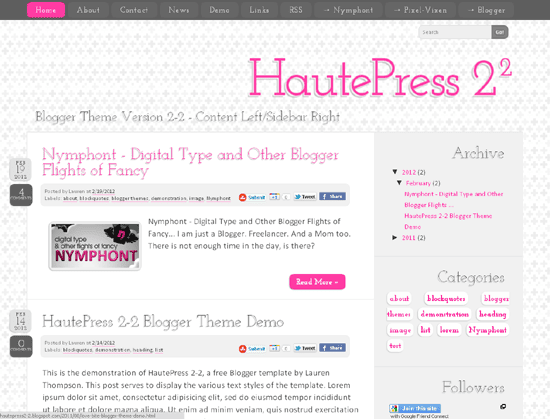 2 column fixed width layout, the second column allowing optional narrow-third column, all sections "widgetized" or "gadget-ready"
3 column footer, also "widgetized"
Template Designer, "Advanced," editing enabled encompassing the font and color selections for most if not all areas of the layout. Working immediatly, the images are included and I will continue to maintian them, however, users are advised to download the images, upload them to their own server, and then replace the image links with their own as the bandwidth could potentially be exceeded in the future. Images can be downloaded from the Nymphont Style TinyPic folder. I have written a post and created a page with specific instructions on how to replace the images in your template on the demonstration blog. Functioning social network icons in the top right sidebar. Your blog's data is reflected once uploaded, so they do not require editing. These allow visitors to your blog to easily submit, share, and save your blog. Functioning search form for searching the blog contents. Blogger Jump Break / expandable post / post summary links styled and customized. 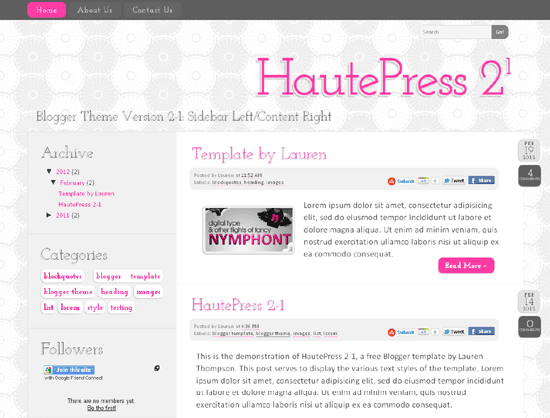 Hot off the presses, new and improved HautePress templates are available. That's right, templates, plural. 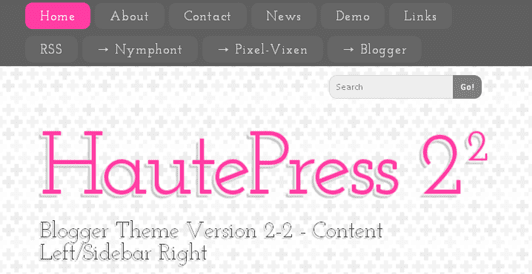 HautePress now comes in a 'sidebar right/main content left' orientation as well as the reverse. In what might be the biggest and the best of the improvements to HautePress, is the enabling of Blogger's threaded comment system. 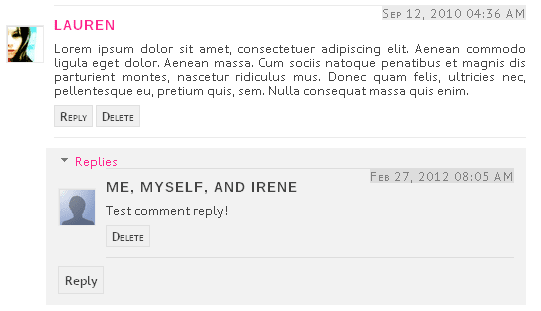 An example comment and comment reply shown in the image above. The preceeding screencapture illustrates how I have designed and coded the PageList widget to handle new-line wrapping. New-line wrapping will now neatly wrap additional line items in the PageList widget. In the earlier version of HautePress, new-lines would overlap, limiting the number of links to what could fit the width of given a browser. To rearrange order of items in the PageList widget, use the widget-edit icon on the actual live blog, do not use the Pages tab in the dashboard. Offical Twitter, StumbleUpon, Facebook, and G+ sharing buttons now in place. These buttons are located between <!-- Social Share Buttons Start --> and <!-- Social Share Buttons End --> of the 'widgets expanded' template code should you like to modify them. Fixed the header image settings for the Header widget. Adding a header image using the Header widget on the layouts tab is now much more efficient. Options for placing an image behind the title and description, and for using an image instead of the title and description are working, and the option to have description display after the image only requires one additional edit to the template code in order to display correctly, in the case that any editing is necessary at all. Two new background image options available. (Did anyone notice the background difference?) To view the new backgrounds as well as the original visit the HautePress Photobucket album. "Responsive"/Fluid width, two columns, in either sidebar left/content right or sidebar right/content left orientations with a two column footer, all sections "widgetized" or "gadget-ready"
Supports Template Designer, "Advanced," font and color editing tools. Working immediately: background image included; however, users are advised to save and upload the image to their own server, as the bandwidth could potentially be exceeded in the future. Images can be downloaded or directly linked to from the HautePress Photobucket album. From Settings, select "Language and Formatting." For the "Date Header Format" choose "DD Month YYYY" style, (two digit day, name of month, four digit year with no commas) and then select "Save Settings." Be sure the format chosen has no commas, or else it will not display correctly. Posts published on the same day will display a blank post date (just an empty grey box) because of the calendar style date set-up. At present there is no way around this (that I know of), so remember to select a different date with the "Post Options," if publishing multiple posts on the same day. In light of the new threaded comment system and other recent improvements made to the Blogger platform, I have been busy familiarizing myself with the new template code. 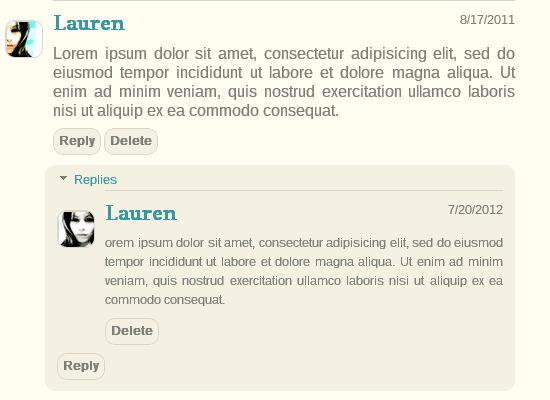 My existing free Blogger template creations will soon be updated and retrofitted with the new comment system. Several new templates will also make their debut here shortly. I've been steady Blogger proggin' over the past few weeks. In addition to the template updates, I've been quite busy working on GlitterBurned and the GlitterBurned Blog. GlitterBurned is a showcase gallery of Blogger powered blogs. Gallery news, updates, and articles are shared on the GlitterBurned blog. Fluid / responsive width content slider on the GlitterBurned Blog. One thing I am happy with, is the featured content slider I shimmied-up for the GlitterBurned Blog. I created a fluid width slider with on-hover text and clickable-links using CSS and MooTools. I believe it to be relatively cross-browser with the small exception that in IE there is no on-hover text, but linked contents are still clickable. Also... 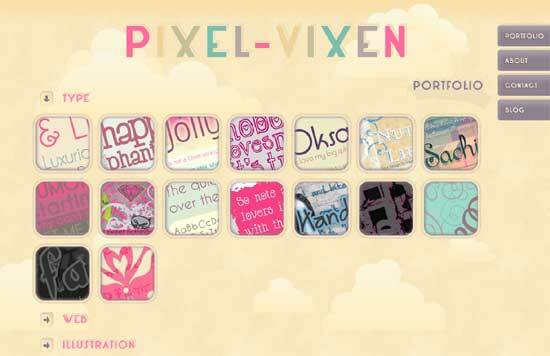 I have unveiled and added the actual blog aspect to my Blogger hosted portfolio site, Pixel-Vixen. I wanted to keep it simple and uncluttered, so I implemented a "toggle" content menu, that is, it expands and contracts with a click at the user's discretion. As always, Pixel-Vixen is a work-in-progress and changes in the blog layout and design are guaranteed to come. Still, this is the premise; simple without clutter. That is the idea, and that will remain. The newly unveiled Pixel-Vixen blog. In other news? I have been stuck on fonts as well. To be perfectly honest, I am not satisfied with the fonts I have created thus far. There are so many things that I did not anticipate or had not considered. But I have no regrets, I accomplished a goal and have been able to learn from the experience.